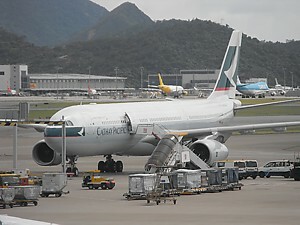 Reviews and opinions are generally favourable about Cathay Pacific airlines, particularly for the premium classes. Where it all tends to fall down is in economy: ask some passengers "What is Cathay Pacific like in economy?" and they may not be all that positive. Quite simply, Cathay love the passengers up the pointy end to an extreme degree. All airlines love those who pay ten times as much for their tickets, but in Cathay Pacific, First Class will always come first. And this is a problem: although there are dedicated crew who look after each class, they will always, without exception, make sure that those up front get their meals and drinks first. However, starting with passenger experiences at check in, Cathay Pacific have the usual three queues for the three classes. What is slightly unexpected is that there are no signs for passengers with oneworld benefits: then again, it does seem to be assumed that if you are a oneworld Emerald, you know you can take the First Class queue with an economy ticket. Cathay Pacific do however like to stick to the rules, and woe betide you if you check in with more luggage than the strict Cathay Pacific baggage allowance. This becomes ever so more important at the Hong Kong hub. Equally boarding is highly regimented, and divided by classes: in economy you will be boarded by rows and sub-cabin too. 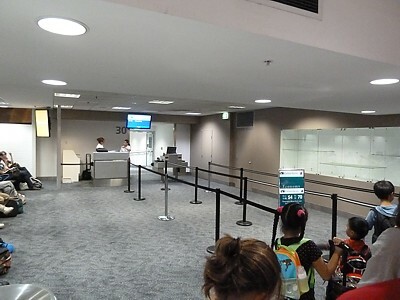 It simply isn't worth trying to skip the economy queue unless you can wave the right kind of Frequent Flyer card, in which case you'll be ushered straight ahead. Don't be shy about this: just join the business class boarding queue. Long Haul in Business Class on Cathay Pacific you can generally expect the staff to greet you by name, and then take your coat. There are pre-flight drinks, including Sparkling Wine. If you are a passenger with status in the Marco Polo club, you will often has the purser come up to you and introduce themselves. 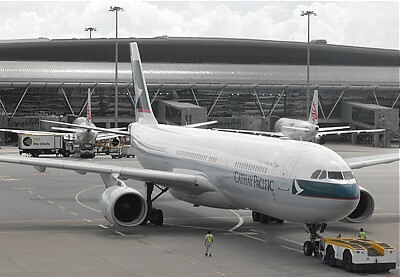 However, this stage is often forgotten for passengers with other oneworld partners: nothing in Cathay can be guaranteed. Cathay Pacific Business Class reviews show service order is generally pretty straightforward. It starts at the front, and works its way to the back. If the aircraft has a mini cabin, service here starts at the back, and makes its way to the front, and the two crew per aisle meet in the middle. The crew will come round with menus, hand out cold towels, and take your meal requests. 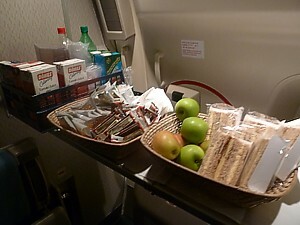 The food is then taken around individually on plates for you, unless the flight is short or the crew rushed, in which case they may use a trolley. Economy class is a different beast, and this is why it pays to show great attention to what aircraft you are on before selecting a seat, otherwise you may end up having to wait ages before getting your food, and then have no choice. Quite simply, the service order on Cathay Pacific is weird. Really weird. 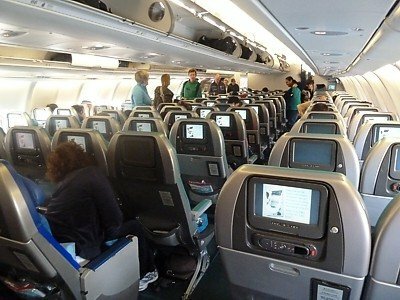 You'll suffer, and it is little wonder that some passengers call it Cathay Pathetic with good reason. Unless you know to sit in the back of the plane (sometimes) so that (occasionally) you get served first, you'll be left confused, disappointed, and hungry. There are 4 trolleys, one per aisle per sub-cabin. On the A330 for the first service they start with 2 at the extreme front (ro 30 and extreme rear (row X), and move through the cabin to meet in middle at row 54. Then all the trolleys go back from row 54 to the rear offering second drinks for the rear cabin only. Second service has all the trolleys starting in the middle (by row 54) moving to the extreme front and back. On the A340, the service is similar, except for the second service, which starts at the front of both cabins, to the rear of both economy cabins. Therefore it is clear, to maximise the chance of you being served food first, you need to sit in the extreme front of the first cabin, or the extreme rear of the second cabin. On the A340 on a nightflight, this will also have the advantage of allowing you an extra hours sleep, before the breakfast trolley on the second service finally makes its way around to you. There are 6 trolleys, one per aisle per sub-cabin. Of course, things are different on the Boeing 747. Here there are three economy cabins, and so there are 6 trolleys which start at the front of all cabins for the drinks service. However, for food, there are only 4 trolleys which start at row 30 and row 48 (the middle of the middle cabin) and then roll front to back. This is reversed for the second service, with row 48 to the front, and rear to row 48. Therefore, on the 747, if you can't sit right at the front, to get your food first, you need to sit just behind row 48, which also allows you some more sleep before the breakfast turns up on the second service: having said that, you won't get much sleep though, as the lights are brutally flicked on two and a half hours before landing. As for your inflight experience on Cathay Pacific Economy Class offers, well, there isn't much. Cathay Pacific like to pump their money into proving two hot meals, which they still do, and with some style: this airline doesn't cut back and just hand you a small cold snack bag, but on the frippery, Cathay Pacific are quite short. In economy there is no amenity kit, or even free tooth brushes in the washrooms. However there are still in-flight menus: these are printed on thick card, and are handed out before takeoff: On the back cover is the drinks list, however, don't get your hopes up. The drinks trolleys only have one type of wine: you have to ask if you want the other, and the crew will finish the entire service, before returning with the other bottle: as a result, it pays to accept whatever is on the trolley, and only after you've finished eating, ask for a different type. Pre-flight drinks don't exist in economy, however a nice touch is that occasionally senior crew members will come around and greet you by name, if you are an elite member of Marco Polo. Occasionally, this perk extends to oneworld higher tier members as well, however it is very rare. When it does happen it is generally after the meal service, and this is often a great time for them to offer to bring forward some wine or other perks from business class. During the flight after the meal service the crew will generally keep themselves to themselves, and only occasionally wander through the cabin: they are however pretty god at bringing you a drink if you press the call button. On longer flights, they will also come around with a snack bag halfway through the flight. Hidden on the economy menu is the detail that you can ask for a pot noodle on request: just press the call button. On the Boeing 747, on flights over 12 hours, Cathay Pacific have an inflight snack bar in economy. True, it isn't much: it is really just a trolley loaded up with sandwiches, biscuits, packets of nuts, and with all the left over juices from the meal run. For many passengers they don't even know it is there: it is left at the third door on the right, between the second and the third set of doors. There are never any announcements that it is there, and unless you go looking, you won't find it: even more annoying is that due to the layout of seats, if you are in the ABC side, you have to walk all the way to the rear of the aircraft and back again, just to find it. 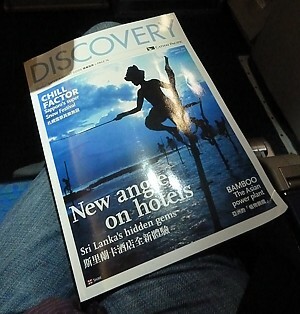 The Cathay Pacific inflight Magazine is called Discovery, and it ranks as one of the better inflight mags. It is produced by ACP Magazines in Quarry Bay in Hong Kong, and comes in a good 120 pages long, although much of this is because pages are printed twice: firstly in English, and secondly in Chinese. All of the sections in the magazine start with "Discover" - from Discover Hotels to Discover Luggage. The first few pages have good information on Whats on around the world, followed by Discover Hong Kong - what's on around the island, and then travel articles that don't overly try and sell you destinations that Cathay flies to. At the back are the usual TV listings for both the AVOD and non-AVOD inflight entertainment systems, and on the rear cover a very useful map of Hong Kong terminal. Cathay Pacific has a pretty standard baggage allowance for each flight. Cabin Bags: Economy Class passengers can take hand luggage of one bag weighing up to 7kgs (15lbs) into the cabin. You'll still be stuck with one bag, but in Business Class it can weight up to 10kg, and in First Class up to 15kg, and although Cathay normally don't check carry on weights, this can't be relied on. They must be no larger than 23 x 36 x 56cm, (approx 9 x 14 x 22 inches). Rules on contents (such as liquids) apply. Even though you can only take one main bag, you can also take a laptop bag in all classes. Check in luggage: On all routes except to the United States economy class can check in any number of bags weighing 20kg (44lbs), business class has 30kg, and First class can check in three bags up to 40kg (88lbs). Routes to or via the United States have economy with one bag allowed to 32kg, business class with two bags (each 32kg max) and First Class with three bags (32kg max each bag). Frequent Flyer Marco Polo Club members get extra baggage. Silver gain an extra 10kg checked in luggage allowance, Gold gains an extra 15kg of checked in luggage allowance (or one extra bag if via the US), and Diamond 20kg (or two extra if to the US). This means that a Diamond Frequent Flyer in First Class to the USA can check in five bags of 160kg. Cathay Pacific's website has details of exactly what you can take onto a flight. Cathay Pacific Extra or overweight baggage charges are steep: an extra US$60 per KG to the UK, Europe or the US: that can be US$1200 for an extra 20kg per sector, so it may be worthwhile paying for Business Class in advance if you know you'll be well over, and while outstations are fairly lax about slightly overweight bags, at Hong Kong Cathay Pacific are unbelievably strict: you can't get away with even 1kg over. All that shopping on the island may cost you dear. Note that there are no overhead lockers in First Class: instead you have your own personal wardrobe. In Business Class all 747s have new expanded overhead lockers, with slightly more space for your case.